J.Thomas Kitchens is a family-owned & operated Design Build Firm that has been in operation for over 30 years. Offering a wide range of cabinetry to fit the needs of any budget. Atlas Home Restorations is a construction company dedicated to helping home owners with the repairs needed caused by recent damages, the urge to upgrade or remodel or lifestyle changes. We are a family owned and operated retail building materials supplier serving the builder, contractor, remodeler, and home-owner since 1931. We are a privately owned & operated full-service company established in 1987. We have 30+ years of experience in the construction field doing new construction, renovations, custom furniture & more! J. Thomas Kitchens is a family-owned and operated full-service Design/Build Firm that has been in operation for over 30 years, offering a wide range of cabinetry to fit the needs of any budget, from affordable, budget conscious cabinetry to high end, luxury cabinetry. We can handle your project from start to finish using our fully licensed and insured contractors. We will design your project, fabricate your cabinetry, and manage your project from demolition, general construction, flooring, plumbing, electric, down to the final finishing touches of backsplash and paint. If full project management is not what you are looking for, We can design, fabricate and install your project that you manage, or we can simply design and sell the cabinetry for your own contractors to install. we also accommodate contractors looking to purchase quality cabinetry from a reliable vendor. We Offer Free In Home Consultation. Owner Joe Cerami meets with clients in their home and brings color and door style samples with him. Joe and his clients discuss their wish list of items they would like incorporated into their kitchen as well as design and style ideas and storage solutions. Field measurements are taken and colors and styles are narrowed down. Within a few days Joe submits 3D rendering concept drawings to his clients for review. At that point any changes or feedback from the clients are discussed and incorporated and then a full set of detailed drawing and pricing is submitted for review to clients. Once design and pricing are agreed upon the project can begin. J. Thomas Kitchens previously operated as CWP Cabinet Concepts but recently had to change our company name and rebrand due to some confusion with a large cabinet manufacturing company. Clawson Architects is an Award winning and nationally recognized Architectural Design firm for those who value design and believe that everyday life can be enriched through extraordinary design. With over 30 years experience, Daniel Fortunato, AIA specializes in custom residential architecture; from additions, alterations, and new home designs, to tenant fitouts in small commercial projects. With 20+ years experience we can do any job you require. From masonry to decking, landscapes to hardscapes, plumbing to electrical, and sheetrock to painting, we've got you covered! Thorsen Construction is an award-winning firm that has been serving NJ for 4 generations. We offer the very best in materials, project management, and craftsmanship available to our clients. Horowitz & Sons Construction Inc.
Horowitz & Sons Construction builds world class custom homes with the finest attention to detail in Northern New Jersey. We stand behind a 10-year warranty for all additions, renovations & new homes! Mendham Design Architects is a design oriented Architectural firm in New Jersey. We pride ourselves on our attention to the needs and budgets of our clients, as well the development of their homes. 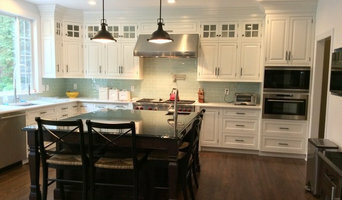 Wexford Custom & Renovations, Inc.
With over 20 years of architectural design and construction experience, Wexford Custom Homes & Renovations, Inc. is leading the field in developing innovative solutions for your home renovation needs. Through unmatched professionalism, we succeed in fostering relationships with our clients based on trust and clear communication. Clients play an active role in the design plans, material selection, and contract development. Once the client has approved these elements, Wexford Custom Homes & Renovations, Inc. works tirelessly to complete the home of your dreams on time and within budget! This combination of integrity and endless creativity has put Wexford Custom Homes & Renovations, Inc. miles ahead of the competition in making your home renovation dreams a reality.